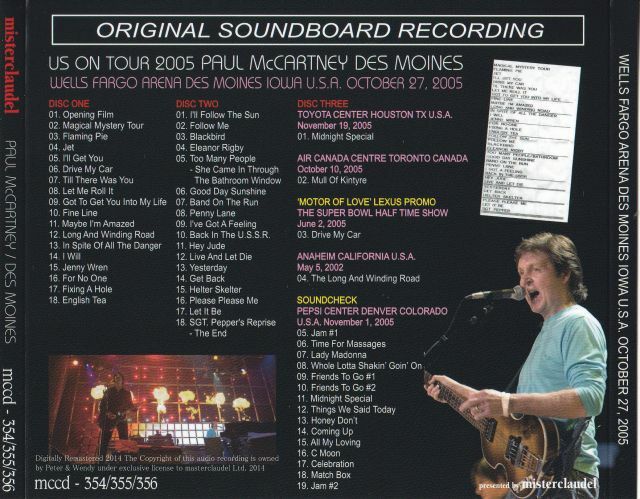 The latest installment of M Claudel , USA October 27, 2005 is the title that you complete recording sound board from the opening film , the concert was held in Des Moines . Speaking of 2005 , it will be remembered as a tour with album Rated in the ” Chaos and Creation ” from the initial release . 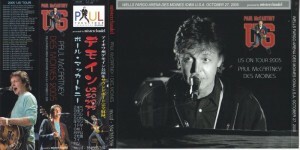 Given that it becomes the album 10 years ago , denseness of the activities of Paul recent here will be realized again . 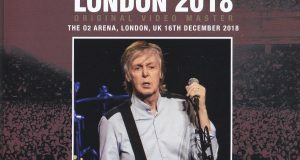 I There is no doubt that it is on the extension of the tour the band members followed from 2002 to the same amount , but still set list is quite different from current to only a tour of nearly 10 years ago already , with the benefit of hindsight There are also a number of songs that are no longer played . Also this tour , tour the popular among fans together that even in comparison with the tour of other age groups , you’re playing a song along with the rare 2004 , a high evaluation of the new album . Opening what is the ” Magical Mystery Tour “, but the Beatles and the ” I’ll Get You ,” ” Till There Was You ” , and ” In Spite Of All Danger ” and ” I Will ” appeared more early . ” I’ll Get You ” will premiere Beatles since the days , since a solo in particular . Rare number that played on stage for the first time through the Beatles era and is led to the ” I Will ” . 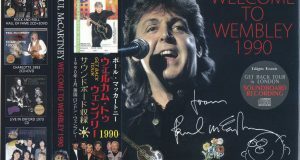 ” Fixing A Hole ” was also played in the 1993 tour , but different arrangements of piano recital with a musical instrument of the pole , and at that time here . What was more surprising is that we ‘re playing is the ” Ram ” collecting , the answer song to John who was increasingly criticized at that time the ” Too Many People ” . When you play in live this song No way , the most premiere , of course , that was played in medley with ” She Came In Through The Bathroon Window ” In addition, the fan was what was really surprised . Has been demonstrated at Angkor surprise another would be ” Please Please Me ” . I think the only famous song impress an image of the early Beatles , how it is reproduced in John absence , and if you judge it by listening really that all means . As a bonus disk , disk 3 I collect the rare tracks that have been released will play in 2005 . We proceed in the same set list through the tour of 2005 , but there are two songs exception . It ” Mull Of Kintyre ” in Toronto November 19, 2005 . Bagpipe orchestra Because it is permanent in Toronto , has become a highlight of the performance in Toronto every time , this year also was no exception . 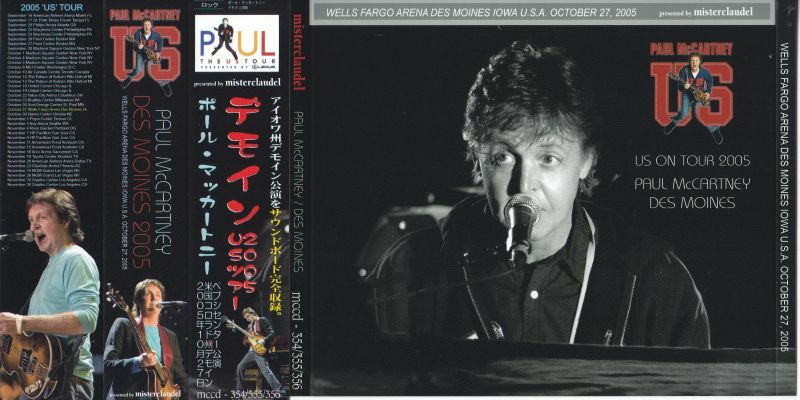 And in the October 10, 2005 Houston , sing Paul favored by only Houston from that place name comes out in the lyrics ” Midnight Special ” was played . I have recorded with a high -quality audience recording these two songs . In addition , Toyota has been backed up as sponsors this 2005 tour , tour Paul had to move aboard the Lexus much . CD as a promotion board of the tour , a collection of songs named after the drive from the edge was produced . 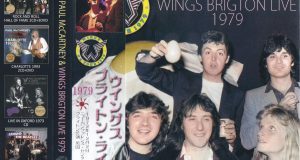 Two songs and “back seat ” together with a ” Helen U~iruzu ” and ” Drive My Car ” and ” The Long And Winding Road ” was recorded the live version of the unpublished whopping that song named after the car I . In this work , I have recorded the two songs . The audio quality is the perfect sound board of course . And finally , this is also recorded in the sound board , the sound check at November 1, Denver , 2005 . Latest work is M Claudel , complete recording by the sound board , the Des Moines concert October 27, 2005 . I did not have recorded only from the ” Magical Mystery Tour ” in its outstanding board but , without a break , this work is fully recorded in a sound board really from the beginning the flow that leads to the intro of ” Magical ” from the opening film . 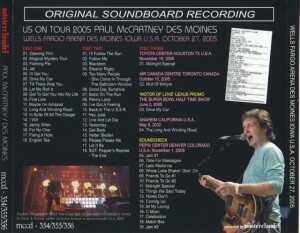 The number recorded rare track bonus disc , and it is the culmination of the 2005 tour . Press Release Athletic permanent preservation of the beautiful picture- disk specification . Japanese with belt .